Global IT asset disposition (ITAD) market expected to reach USD 18,703.42 million by 2022 with the CAGR of 8.33% between the years 2016-2022. Asset disposition refers to getting rid of an asset by direct sale or some other transfer method. The changes in IT industries and development of technology on daily bases such as cloud computing, Artificial intelligence, big data analytics, and the Internet of Things (IoT) has created many problems of mounting e-waste. IT Asset Disposition (ITAD) solution helps to the organization to destroy and recycle of IT equipment types with reliable, environmentally friendly and securely. ITAD is increasingly being adopted by many companies across the globe to manage this waste disposal, minimize the risk of data loss and subsequent monetary loss. 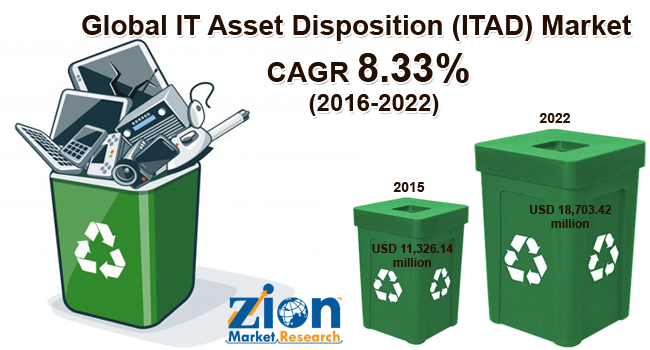 The global IT asset disposition (ITAD) market was valued USD 11,326.14 million and expected to reach around USD 18,703.42 million by 2022 with the CAGR of 8.33% between the years 2016-2022. The major factor driving the growth of IT asset disposition market is increasing adoption of new technology and BYOD trend in many organizations. BYOD estimated to grow from USD 35.10 Billion in 2016 to USD 73.30 Billion by 2021, at a CAGR of 15.87%. Growing trend of BYOD has created demand for IT assets disposition because employees are using old version on their laptops. In addition, technological advances in cloud computing, big data analytics, and the Internet of Things (IoT) are reducing the lifespan of IT equipment and thus increasing the dependence on ITAD services. The regulatory changes across the globe for minimizing the environmental hazards which are created by electronic waste are expected to drive IT asset disposition market. Government regulations for saving the data and environmental protection have grown more demand for IT assets service. Many industries are regulated by different kinds of privacy protection rules such as HIPAA or FACTA. The lack of awareness and high service costs may limit the growth of the market. However, the company needs to recover maximum value from retired or non-working assets which will increase the market growth in coming years. Remarketing and value recovery accounted the major market share of 30.86% in 2016. Remarketing and value recovery provide the financial return from electronic assets and it includes benefits such as increase efficiencies, security, and sustainability of assets. Small and medium enterprises aim is to reuse IT assets equipment through refurbishment, redeployment, resale, and disassembly. This process provides maximum return to companies from assets; this is the key factor for driving this segment. Computer/Laptops segment has held the maximum share of 51.87% in 2016 and valued at USD 5,064.38 million. Computers/Laptop has tremendously improved the way of businesses. Computers are cost-effective, provide the high speed and easy to use. The laptop provides the flexibility to work from anywhere and also can run without electricity. Considering these factors, computer/laptops segment expected to grow to reach USD 10,091 Million by 2022. SOHO and medium enterprises segment expected to grow with highest CAGR of 10.34% in 2017-2022. The rapid growth of the small & medium industrial sector across the developing & developed countries is the major driving factor. The major factors that are contributing to growth are more jobs, increased productivity, better skills, and education. Owing to the SOHO and medium expected to grow with the highest growth. IT and Telecom acquired the market share of 25.25% in 2016 and expected to reach USD 4,426.09 million. Rising requirement of advanced technology are reducing the lifespan of IT assets equipment in IT industry is creating the need for IT asset disposition service. High competition in the telecom industry is creating the requirement of the latest equipment in this industry. These factors are increasing demand for IT asset disposition market. Asia Pacific region is expected to be the fastest growing region and will hold 30.90% market share by 2022. High technology adoption and industrialization in emerging countries such as South Korea, India, and Australia are contributing to the growth of the market. Additionally, increasing awareness towards environmental safety is propelling the growth of IT asset disposition market. The report includes detailed profiles of the prominent market players that are trending in the market. The lists of the players that are compiled in the report are Iron Mountain Inc., TBS Industries, CloudBlue Technologies, Inc, ITrenew Inc, Apto Solution, Inc, TES (Singapore) Pte Ltd, LifeSpan International Inc, Sims Recycling Solutions, Inc., Arrow Electronics, IBM, Hewlett-Packard Company, Dell Inc and others. The prominent market players maintain the competitive edge in the global market by making investments in the mergers and acquisitions and by increasing their product portfolio. In 2015, Arrow Electronics, Inc. has acquired RDC which is leading technology returns and Asset Management Company.